A mellow and rich Single Malt, presenting a perfect balance between the sweet notes of apple and blackberry and a spicy dryness. The Singleton presents the Dufftown Single Malt. Formerly available from the 'fauna & flora' range, this expression that has just entered the age of maturity is appealing and has got a lot of drive. This 18 Year-old spirit has everything to please! The Singleton of Dufftown is a mellow and rich single malt, presenting a perfect balance between the sweet notes of apple and blackberry and a spicy dryness. 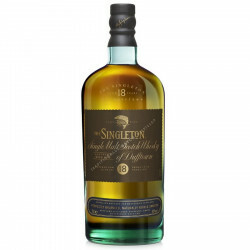 The Singleton of Dufftown bottle's unique shape is inspired from the traditional flask. The color of the glass reminds of the blue 'lead glass' in use at the end of the last century. Nose: soft and appealing, dry, reminiscent of autumn. Opens firstly on apricot fruits compote and ripe apples. A while in the glass reveals unmistakable hazelnuts and roasted nuts, bolstered by a sweet, subtle woody scent (dried tea leaves, pine resin). The fruits soften and give way to rich vanilla, toffee and chocolate flavours. Palate: firm and full, nuts, toffee and mint delicately envelop the palate, before being overflown by rhubarb and apple juice. Darker fruits in the backdrop. Finish: long, creamy and warm, with a fruit compote freshness undertone. Reveals also a whiff of spicy wood and a touch of blakc pepper.